A water heater by-pass kit can save you money in two ways. It saves from using an extra six or ten gallons of non-toxic RV antifreeze needed to fill the water heater tank when it’s time to winterize your RV, and it prevents costly damage like ruptured water lines or a ruptured water heater tank. If water is left in the lines or tank they can freeze and expand, splitting the lines or tank. With a bypass kit you simply drain the water heater, put it in the by-pass mode and the antifreeze by-passes the tank and goes directly into the hot and cold water lines throughout the RV. 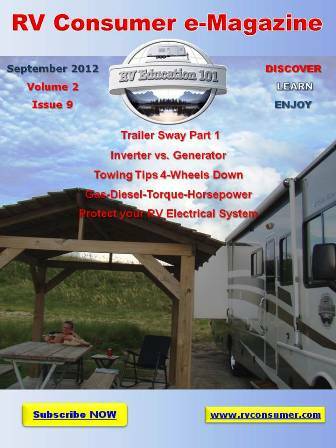 If your RV water heater does not have a bypass kit they are easy to install. The first step is to make sure any water supply coming into the RV is turned off; this includes the 12-volt water pump. Release any pressure on the water system by opening a hot and cold water faucet in the RV. Now you can drain the water heater. Caution: Never drain the water heater tank when it is hot or under pressure. There are a couple of different types of bypass kits available. The bypass kit I use is from Valterra Products, and is a common type of kit. It includes two brass valves, a bypass hose and Teflon tape. When the water heater is installed in your RV there is a cold water supply line connected to the cold water inlet at the bottom of the tank, and a hot water line connected at the top where the hot water leaves the tank and goes out to the RV. The first step to installing the bypass kit is to remove the hot and cold water lines and the existing fittings from the water heater tank. You may want to mark the water lines so there is no confusion when you reconnect them. Use the Teflon tape to wrap the male threads of the new brass fittings that will go into the water heater tank. Install the valves in the water tank and tighten them. Note: Make sure male threads for the bypass water line are facing each other when they are tight, so you can install the bypass hose. These threads don’t require any Teflon tape. Install the water bypass hose and tighten the fittings one half turn past finger tight.